Everyone knows YouTube as a biggest entertainment hub on internet. But do you know there are multiple ways to make money on YouTube! I am not going to show you just 1 or 2 ways to make money on YouTube but almost 15 ways to earn from this. YouTube is the second largest search engine on the internet, with over a billion users, and each day those users watch a billion hours of video, generating billions of views. You can find more interesting facts on YouTube here that will show your earning potential. So much potential & so many earning opportunities but where exactly the income opportunities lies in YouTube & how to make money on YouTube? As we are talking about making money on YouTube, you should understand that you have to create videos & upload on YouTube. All your videos must be original & interesting so that you can get good number of views. Creating videos is not that hard. You can create a video even with your smartphone. If you want to be more professional then you can buy high quality cameras or screen recording software. YouTube Partner Program comes on the top of the list in making money from YouTube. Most of the people who make money on YouTube earn through partner program only. You need to create your own YouTube channel and when upload interesting videos in your channel. Once you receive 10000 views, you can apply for YouTube Partner Program and start making money from YouTube. There are many YouTubers who make millions through partner program. There are even examples like ‘Charlie bit my finger’ where only 1 video of 1-2 minutes is making millions every year. Even an average or part time YouTuber is making $500 to $1000 per month without any problem. We have written a complete guide to make money using partner program here. You can access this free using the given link. This guide will explain you everything like how to make quality videos, how to get views & subscribers, how to place ads in your video etc. You can also refer this list of 25 best YouTube video ideas to find most popular niche on YouTube. If your channel is based on topics like how-to, technical, cooking, TV programs, movies or anything that people search on Google then its a good idea to create a blog. You don’t need to write any new content for the blog. Just publish videos from YouTube channel to your blog. If you want to add more value to this, you can post the video script below your videos so that people who don’t want to watch video, can read it quickly. Starting a blog is easy and does not take much time. There are 2 benefits of publishing your videos to your own blog. First benefit is, you will get additional views on your YouTube videos from your blog. And second benefit is, you can make additional income through your blog through Google AdSense or Amazon. If you want to take your blog to the next level, you can apply SEO techniques or promote on social sites. If done correctly, this way of making money on YouTube can give better earning than YouTube partner program. Just become an affiliate related to your video & promote it. One who like to watch videos related to entertainment like movies, songs, humour & information like news etc. Second type of people who like to watch videos for getting the solutions of their problems like health & finance, legit reviews of products, how-to videos etc. You can make great affiliate income from this second category of people. You can create solutions for such people. You can try different YouTube keywords tools that will help you to find keywords that you can target for your video. There are hundreds of best affiliate programs & networks like Amazon, MaxBounty, Clickbank, CJ, FlexOffers etc where you can find products related to any niche. You need to do the proper research & provide only the legit solutions otherwise people will give you negative comments and ratings. It can spoil the reputation of your YouTube channel. You can insert affiliate links directly in the description part of your video. Make sure to use proper tags, title and description to rank your videos in YouTube. There are thousands of videos on YouTube that receives large number of views daily but the person who created the channel do not know how to make money on YouTube. If you are one of them and don’t want to monetize with other methods or want an additional source of income with the same YouTube videos, then this is for you. Just add a simple line in the description or at the end of each video like ‘”advertise by placing your link here”. You can ask the customers either to contact you by email OR give the price details so that only the interested people will contact you for placing the ad link . You can decide how much you want to charge depending on your daily views. Suppose, you are getting around 100 views per day for a video, then you can ask a monthly payment of 10 to 12 dollars depending on the topic of the video. If you have 50 to 100 such videos, you can earn between $500 to $1000 a month or more. There is one good tip if you can utilize. As I said, there are million of videos which are not being utilized for any commercial purpose. 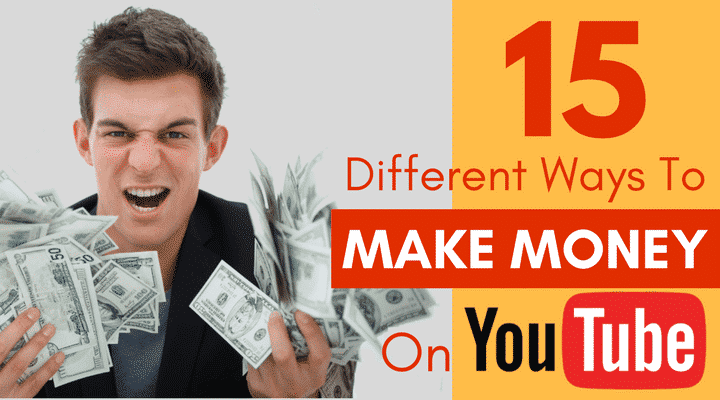 So if you want to earn money from such YouTube videos, you can become a middleman and find the customers who want to place their website links on such videos. On the other hand, you search for videos where you don’t find any links in the descriptions so that you can contact them and place their links who give you the approval. The catch is you charge more to the customers and pay less to video owners. How much money you make on YouTube using this way depends on your negotiation skills. This one is the gold mine. If you do it professionally, you can make a full time living using this method. There are tens of thousands of local business in your area who does not have any (or much) online presence. Just contact such businesses and ask them if you can create a video describing their business, products, and services and upload them on YouTube to get an online presence. Convince them, how this can make an impact on their business. Be it a local restaurant, a saloon, a real estate agent, a marble merchant, a cake shop or any local business owner. Just get out of your home and come to the nearby street and you will find hundreds of such businesses in 1 km circle. You need to be professional here. Contact these business owners and show the advantage of how he can you grow his business online and beat their competitor. You can easily earn between $2000 to $3000 with this way. How much you will charge, monthly, yearly or one time, what strategies to use etc. will come only through experience. So just get into the business and start making money on YouTube. Once you’ve have become an established YouTuber with loyal followers and subscribers then you need to think of creating and selling your own product. In affiliate marketing, you promote on other’s behalf but here you are going to create your own product first, then do some market research and finally promote it through your videos. Creating your own branded merchandise like T-Shirts, Caps, Mugs etc can be challenging if you don’t have necessary funding. What you can do is create some videos regarding your merchandise and check out views and comments your video receives. You can sell your products through giving a link in your videos. If you are not being able to create physical products because of lack of funding then you can sell digital products on your YouTube channel. Digital products are lot easier to create and sell. In fact, you can create them for free. Digital products are downloadable products like eBooks, podcasts, videos, software etc. Hence, very easy to create! I would suggest you to create tutorials in the form of eBooks and videos. You can easily sell them to your audience leveraging power of your personal brand. If you are receiving millions of views for your channel then you can cut out the middleman and sign up directly with sponsors. The best part of sponsorship is that you will receive the full amount without splitting it with YouTube. Direct sponsorship can be more lucrative than affiliate marketing. Sponsors would advertise their products to your target audience through your videos. However, getting sponsors wouldn’t be easy because there is no fixed formula to it. You can check websites like Grapevine, Famebit etc. for finding sponsors. It will totally depend upon the number of subscribers your channel have, type of your audience and budget of sponsors. You can also get brand deals where you become a brand ambassador of a particular product or merchandise. Power of your brand on YouTube will help you to sell products to your audience. If your subscribers are loyal and love to watch all your videos religiously then you can charge them a fee for watching your videos. YouTube allows you to produce premium content and sell its access to your audience for any fee you choose. The concept is very simple, you just give away some free content on YouTube however you restrict access to the best content behind a subscription/paid membership wall. If your audience wants to watch more videos then they have to pay a monthly or yearly membership fees. If you are getting huge views and comments for your free videos then you are more likely to convert few of them to paid membership. The best example for this is YoungTurks. For watching their premium content viewers have to pay a fee. Licensing your videos to media houses is another great way to make money with YouTube. However you need to create viral videos with millions of views in just a short period of time. For example, cute baby videos like ‘Gangnam Style’, ‘Chocolate Rain’ etc. or even animal videos. Viral content are needed by mainstream media for their various channels like morning shows, news programs, baby videos and even online sites. They are ready to pay you anything if you have great videos. You can license your videos to these media houses in exchange for money. Visit Junken Media where you can easily find right people who would be willing to pay you for your videos. Once you have become an established YouTuber with tens and thousands of subscribers then you can start giving consultancy to other video creators and small businesses who are desperate to leverage power of YouTube. If you are getting paid for your free videos then obviously you can make even more by giving one on one consulting services to other creators. You are going to tell them how they can create a YouTube channel from scratch, what types of videos they need to create, how to create them and building an army of subscribers for their channel. You will be charging a free on hourly basis for each session you conduct. After become a famous YouTube personality you can look out for speaking opportunities at various events, seminars, parties, academies etc. You can speak, in not just your country but around the world. You get paid for speaking just for few minutes on a stage. However, paid speaking gigs are not for everyone because you are going to be invited only when you are famous enough with millions of subscribers. So this isn’t for less popular YouTubers however what they can learn is how paid speaking gigs are further helping popular YouTubers to build their brand. You can also emulate the same. You already know the concept of Crowdfunding. You basically raise money by asking people to chip in. If you have a great idea for a media project on YouTube then you can ask people for donations through your YouTube videos. You will not only generate funds but also audience and new subscribers for your channel. You can also use Patreon for monetizing your YouTube channel. You just have to create your YouTube channel’s profile page on Patreon and set goals. You can tell your fans about the different membership opportunities in your YouTube channel and let them pay for it. YouTube channel is also just like a website. You can sell both of them whenever you like it. However before you sell your channel for money you need to have large number of subscribers with huge search engine traffic. Moreover, make sure that the production of the channel isn’t tied to your personality. Although I have explained all the possible ways of making money on YouTube but there might be other methods as well that you can use to make money from this. If you know any of such method, let me know so that I can include that in this article. I am eager to know, if you are making any money on YouTube or looking to start earning from any of the method explained above. I appreciate your comments and let this travel to others though your recommendation so that people can benefit from this. Very good insight into Youtube as a business idea. Very nice and interesting ideas! Very glad to know these ideas, and thank you so much for sharing such helpful tips. Wow, what a great article. I may need to read it a few times to absorb. Thanks for sharing.